There are a few others such as; trauma to the skin, certain surgeries, and ultraviolet rays. Varicose veins can be uncomfortable and is some cases painful. The symptoms are; restlessness, burning or throbbing sensation, and cramping in the legs. These symptoms can often be relieved by elevating the leg or wearing support type stockings. For women, the symptoms will increase during certain times of the menstrual cycle and pregnancy. A painful blood clot with inflammation occasionally occurs with varicose veins called, thrombophlebitis. There are treatments available for varicose or spider veins. A conservative method is to simply wear tight fitting support stockings. Another would be a lifestyle change such as; weight loss or change in employment. A lifestyle change however is not always practical; so removal of the veins may be necessary. A procedure called, Sclerotherapy is available and will have the vein disappear in three to six weeks. The method uses a highly concentrated salt solution that is injected right into the vein. The solution will irritate the lining of the blood vessel, which causes it to swell and bind, which then causes the blood to clot. Over about six weeks, the vessel will turn to scar tissue and fade from view. This procedure is simple, and can be performed as an outpatient visit. A laser treatment, Endovenous Laser, can also remove the spider veins. Local anesthesia is used, but the procedure can be done as an outpatient service. With this method a small laser fiber will go into the vein to deliver pulses of laser light directly into the vein. These pulses will cause the vein to collapse. Another outpatient procedure, Radiofrequency Occlusion will collapse the vein. The procedure involves a small catheter being inserted into the vein which will deliver radiofrequency. Radiofrequency causes the vein wall to heat, collapse and then seal. A local anesthesia is often administered with this procedure. Surgery techniques are also used to remove spider veins which involve tying off the vein and removing a long segment of it. Ambulatory Phlebectomy allows for a large surface area to be removed with tiny incisions that do not require stitches. This is often used on larger veins and involves local or general anesthesia. This removal can be performed with the patient returning home the same day. Vasculight and PhotoDerm are also options as treatments. These are surface lasers using intense pulsed light. The device uses heat energy to damage or destroy abnormal veins. The advantage to this method is there are no needles; however there is some discomfort. The side effects to this method is; discoloration and blister formation. 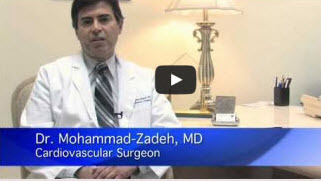 Doctor Zadeh is one of the top specialists in spider vein removal. When you are ready to have your spider veins removed, and are looking for quality performance, contact the office of Dr. Zadeh to schedule an appointment.